Award-winning writer/director Kim Han-Min ('Handphone,' 'Paradise Murdered') will unsheath the lavish historical action epic this February on Blu-ray. In an early announcement to retailers, Well Go USA is working on 'War of the Arrows' for Blu-ray on February 21. The film was honored four times at the 2011 Daejong Awards, including Best Actor (Park Hae-il) and Best New Actress (Moon Chae-won), and picked up five trophies at the 2011 Blue Dragon Film Awards, including Best Actor (Park Hae-Il), Best Supporting Actor (Ryoo Seung-Ryong), Best New Actress (Moon Chae-Won) and the Audience Choice Award for Most Popular Movie. Set in 1636, the second Manchurian invasion of Korea rages chaos, as villages are attacked by overpowering Manchurian soldiers. The Manchurians kidnap childhood sweethearts, Ja-in and Seo-Goon on their wedding day. 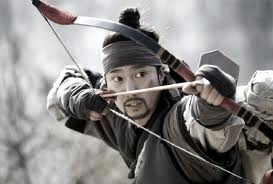 In an effort to save his sister, Ja-in’s brother Nam-Yi sets out to defeat the enemy and save his sister and other Korean victims with only 1 bow. Specs have yet to be revealed, but the release will be a Blu-ray/DVD combo pack and supplements will include Actor and director interviews, The Making of War of the Arrows featurette, deleted scenes, and theatrical trailers. Suggested list price for the Blu-ray is $29.98. You can find the latest specs for 'War of the Arrows' linked from our Blu-ray Release Schedule, where it's indexed under February 21.